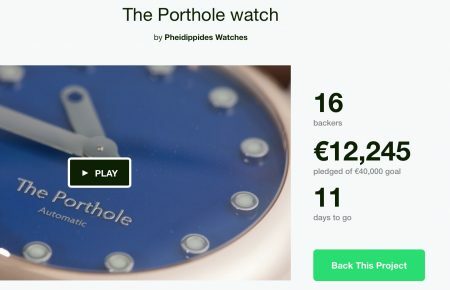 We are just over halfway the Kickstarter campaign and already 15 people pledged for The Porthole. For a watch that is on the higher end of the watch range offered on Kickstarter that is quite a nice result. It shows I am touching a nerve ;-). It is common for campaigns to be slow in the middle, so I expect some activity towards the last week. Activity that shows the trust of others in my project. Lets hope they will tip the campaign over to a success. In the meantime I managed to get The Porthole featured on 8 different watch forums. I am really happy about that. The common denominator on all these forums is ”something appealingly different and a nice balanced design”. Could I wish for more? Please check the bottom of The Porthole page. Be checking in with you next week with another update on the campaign.